At Duke Nursing, our goal is to provide Opportunities for a Lifetime for today's top nursing and health care professionals. Beyond attracting high-quality talent, we also strive to create professional environments that motivate our employees to learn, to grow in their careers, and to achieve their greatest potential. Duke Nursing offers an attractive pay structure, and annual performance increases for nursing staff. 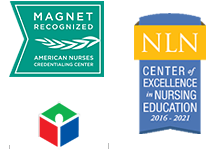 Shift premiums, paid time off, Nurse Loan Forgiveness, certification bonuses, and a unique Clinical Ladder Program that helps you advance your career are added benefits that not only recognize, but reward nursing excellence in patient care. Duke University Health System (DUHS) values the education of its nursing staff and offers a unique Nursing School Student Loan Forgiveness Program for registered nurses with outstanding pre-licensure student loans. The program is for eligible full- time (.9 FTE or 36+ hours/week) nurses hired on or after July 1, 2013, who work in procedural areas and provide services to inpatients. Total payment is up to $25,000 for loans acquired in the attainment of a nursing degree. The Duke University Health System Clinical Ladder Program recognizes the expertise of nurses who make a difference at the bedside, and provide exceptional clinical leadership. There are three distinct tracks: Education, Practice, and Management. All new graduate nurses enter the clinical ladder at a Level I, and are required to advance to a Level II within 18 months of employment in the health system. Levels III and IV are voluntary achievement levels that require additional education, leadership management, increasing administrative responsibilities, and specific nursing years of service. Increases in compensation reflect upward progression on the clinical ladder. Duke University Health System (DUHS) and the Duke University School of Nursing (DUSON) support the continued education and learning of our registered nurses, as we believe a highly educated nursing workforce further strengthens the quality of care, clinical outcomes and translation of nursing research into clinical practice within our system. The Registered Nurse Tuition Assistance Program (RNTAP) provides funding in conjunction with the Duke Employee Tuition Assistance Program. For eligible registered nurses, RNTAP contributes up to 90% of tuition for study toward a Master's degree, post-Master's degree certificate, and Doctorate of Nursing Practice (DNP) at the Duke University School of Nursing. Designed to recognize Registered Nurses who have specialty trained competencies, to develop nursing leadership, and to enhance nurse recruitment and retention at Duke University Health System. Nurses are eligible for an initial one-time payment of $1000 for completion of a specialty certification. There is a $750 payment upon renewal of the original certification. to North Carolina. Application must be submitted within 90 days of permanent address declaration. Relocation financial assistance is subject to federal and state tax. The Duke University Health System offers comprehensive benefits designed to reward and empower employees - both personally and professionally. Duke’s overall benefits plan has long been recognized for its comprehensiveness and competitiveness in the market. In addition to a robust array of traditional benefits such as health care, dental care and retirement, Duke also offers a wide range of family-friendly and cultural benefits to attract, support and reward skilled employees. Visit hr.duke.edu for a full listing of benefits offered by Duke University Health System. Duke Nursing is committed to creating a workforce of the most highly-skilled, diverse and compassionate nurses and health care professionals from around the world. We know that one of the greatest sources of finding new talent comes from you! We encourage you to invite your friends, family and colleagues to join the Duke Nursing team today.